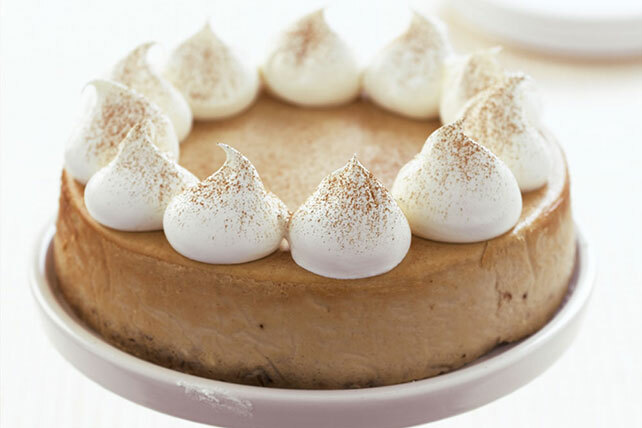 A walnut crust encases a creamy coffee cheesecake flavored with a hint of cinnamon in this cappuccino-like treat. Mix nuts, butter and 2 Tbsp. sugar; press onto bottom of 9-inch springform pan. Bake 10 min. Meanwhile, dissolve instant coffee with cinnamon in boiling water. Remove crust from oven. Increase oven temperature to 450°F. Beat cream cheese, 1 cup sugar and flour with mixer until well blended. Add eggs, 1 at a time, mixing on low speed after each just until blended. Blend in sour cream. Gradually beat in coffee; pour over crust. Bake 10 min. Reduce oven temperature to 250°F. Bake 1 hour or until center is almost set. Run knife around rim of pan to loosen cake; cool before removing rim. Refrigerate 4 hours. Top with dollops of COOL WHIP. Garnish with a sprinkle of additional cinnamon, if desired. Savor the flavor in a serving of this special occasion dessert. Reduce oven temperature to 300°F if using a dark nonstick 9-inch springform pan.